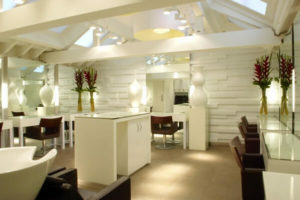 Located in the heart of Covent Garden in a striking Grade II Georgian Townhouse, the House of Charles Worthington when fitted out in 2009 a truly unique hairdressing experience. A luxurious, indulgent interior with an intimate, personal atmosphere, the 4,000 square feet site provided world class hairdressing expertise alongside all the comforts of a homely and welcoming environment. Spread across five floors, the salon retained the structure of a home including a Conservatory, Drawing Room, Dining Room, Study, Parlour and Dressing Room. The salon has since proved to be a huge hit with clients and celebrities alike choosing the salon as their destination of choice.